Our pockets are filled with Zlotys and we’re out of the Airport Terminal building. The first thing we notice is that our cab driver at the airport is dressed in a very nice sport jacket, tie, button down shirt, trousers and nicely polished shoes. He is extremely polite and almost bows to us as he places our backpacks into the immaculately clean trunk of his cab. This is not a limousine or a car hired to greet us at the airport. This is just your run of the mill taxi cab driver. I could make a wisecrack here about the Pakistani cab drivers in New York, but I won’t. Krakow is an old city (dating back to the 10th century) with a very young population. 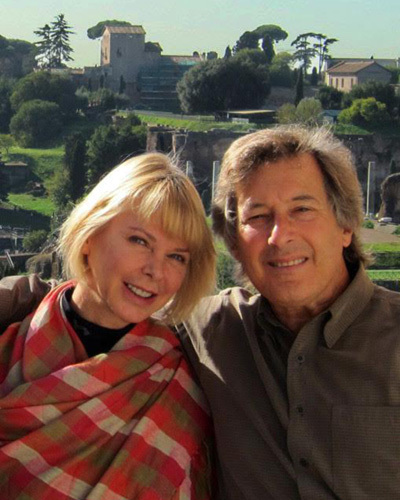 There are currently over 20,000 students at the Jagiellioian University; one of the oldest universities in the world. In fact, Copernicus was a graduate in the 15th century. It still ranks as one of Europe’s most elite. We’re staying at the Hotel Stary, next to the famous Stary Theatre in the Stare Miasto, the Old town. We’re right off the main old square known as Rynek Glowny, the largest main square in all of Europe. It’s really big. There’s an old cloth market (now a tourist trinket mecca) in the center that would engulf most European town squares, but here, it barely covers 1/8th of the area. The 17th century buildings that face the square are filled with old cafes and restaurants. It’s been the life source of the city for well over 300 years and with the exception of cars, athletic shoes and the value of the zloty, it’s probably not much different today than it was a hundred years ago. People still walk through the old markets, stop for coffee, beer, cake and of course good Polish cooking. On our arrival we ventured out and found the sausage wagon. Actually, it was an open grill cooking kielbasa, fried cabbage, ham and fried cabbage, pork knuckles and fried cabbage, blood pudding, blood sausage, bigos (fried cabbage with ham, potatoes and something else), french fries and a whole assortment of pickles and creamed thingies and more fried cabbage. We settled on 2 plates of kielbasa and a side order of ham and fried cabbage. We were in pig eating heaven. We’ve been looking for this sausage wagon every day since but it seems to have vanished. Was it a dream? Was it one of those magical wagons that only appears every 100 years like Brigadoon? We can’t figure out whart happened to it, but we keep going back to the spot every day. The weather has turned cold and rainy. Autumn in Poland is the rainy season and it’s been raining a lot. Our first stop is a tour of the Wawel (pronounced Vavel), the old castle built on what appears to be the only hill in Krakow. Supposedly it was build over the cave of a dragon. And of course, if you build your castle over the cave of a dragon, you’re going to really piss him off. After years of dragon attacks, a young boy finally defeated the fire-breathing beast by throwing a sheet soaked in some flammable grease (probably pig fat) into the cave. When the dragon grabbed it into his mouth, the boy lit it on fire. Within seconds it was dragon flambée. These days the only thing left of the dragon are really silly stuffed animal versions for sale at every souvenir stop. We’ve discovered the restaurant Chlopskie, a variable bastian of Polish country cooking. We were served a basket of kweby (village bread), but instead of the small dish of butter or olive oil, it was accompanied by 2 large mugs; one filled with cream cheese and chives and the other with bacon fat, yep, a big mug of cooled bacon fat with small bits of fried pork. Both were excellent. For our first meal there we ordered a grand helping of cabbage rolls (kwempke) and pierogies. We always remembered our Grandmother’s versions, small cabbage leaves rolled around rice and meat and cooked in a tomato sauce, but these kwempkes were enormous, giant cabbage leaves stuffed with lots of rice, meat and salt, lots of salt. We were so full, we never got around to the rolled herring in cream sauce, the borsch with eggs, borsch with potatoes, borsch with beans, or the Stone soup. Stone Soup? I remember the story of stone soup when I was a kid. It involved an itinerant poor man carrying a large pot who comes to a small town and tells the people he can make the best stone soup in all the world. The townspeople are intrigued and when he tells them he’ll make it for them for free if they’ll only help him with a few of the ingredients. He throws the stone into the pot and then has them bring fresh spring water, potatoes, carrots, onions, beef, barley, spices and wood to cook it all. It’s delicious, of course. The village people are extremely happy. It is the best stone soup they’ve ever tasted. We had no idea if this was the same story. But, we never ordered it. We may never find out the secret of Polish stone soup. As in many cities across eastern Europe, or all of Europe for that matter, not much remains of the old Jewish neighborhoods. It’s almost hard to imagine that once upon a time there were 60,000 people and 7 active synagogues in the Kazimierz district of Krakow. Only 2,000 survived the Holocaust. In 1941, the Kazimierz population was moved into a ghetto across the Vistula river, close to the German factories. They originally provided cheap labor, but when the trains began to arrive, they were sent off to the death camps. One of these factories was owned by war profiteer, Oskar Schindler, recently immortalized by Stephen Speilberg and Liam Neeson. Originally Schindler saw the profit by paying the Nazis a low wage for the use of the jewish workforce. But once he saw the what was really going on, he gave all the money back, plus more; paying off the guards and saving over 1100 lives that would otherwise been condemed to death. About 200 Krakow jews now live in the Kazimierz. 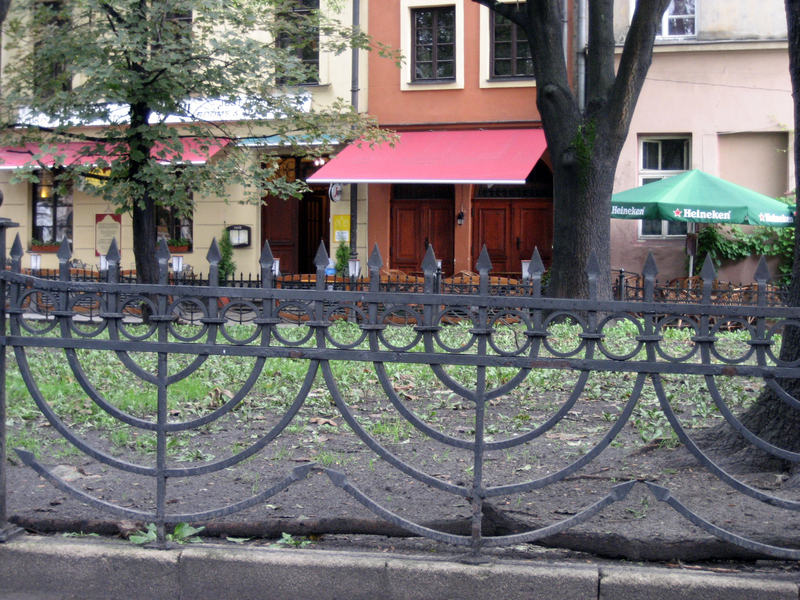 Of the 7 synagogues that used to fill the square on Szeroka Street, only one has survived. The others have turned into a museum, a monument restoration house, a matzoh factory, a movie house or simply “under restoration”. But the Kazimierz can still give a vivid picture of what life was like before the war. The old square is simple and charming and, like the Marais in Paris, it’s currently become one of “the” places to live in Krakow. The old merchant shops are now transformed into trendy restaurants and bars and the old worn out houses are being renovated back to their former beauty. In fact, one of the houses along the square was where beauty queen Helena Rubenstein grew up. Behind the old Remuh synagogue is the 16th century jewish cemetery. An excavation in the 1950’s unearthed hundreds of tombstones that some archeologists believed were taken down and hidden from the Swedish invasion of 1704. Over 700 stones have been restored and put upright again and the restoration continues. 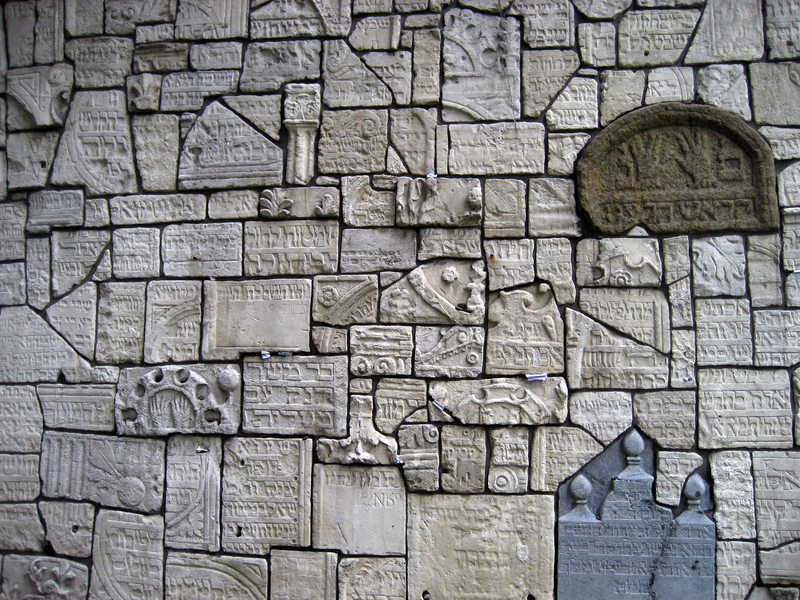 Other fragments from jewish cemeteries all over Poland have found there way here and are now incorporated into the surrounding mosaic wall. We could have used another 2-3 days in Krakow, just for the stuffed cabbage and sausages. Although we did see the amazing art collection, including Da Vinci’s “Lady with an Ermine” at the Czartoryskich Museum, we missed the National Museum, the Gallery of 19th century Polish art, the Archaeology museum with the only representation of a Slavonic god in existence, the Krakow History Museum and the famous Wieliczka Salt Mine outside of the city. In other words, 4 days is just not enough. In the 90 minute drive from Krakow to Auschwitz, our driver, Wojtek, tried to divert our anxiety by giving us a tour of the tranquil Polish countryside. We passed one of the few remaining coal processing factories (the pride of Soviet/Polski industrial might), we rode through the most famous keilbasa town in all of Poland (could this be the home of our beloved sausage wagon?). Our diesel Mercedes was luxurious and comfortable but Wojtek preferred to wax poetic about his 1985 Polski Fiat (the Polski porsche), rear engine, 30 HP, .06 liter engine. “The new diesel cars are OK”, Wojtek told us, “but sometimes Polish people use frying oil instead of diesel and it smells like French fries.”. “They do what?” we asked. From the moment we arrived to the Auschwitz Death Camp, we could feel the weight of the silence. This is not just a memorial to the extermination of life, it is a place that will forever linger in agony, despair and unresolve. Over 1.1 million people were killed in these camps between 1940 and 1945. 200,000 of them were small children. 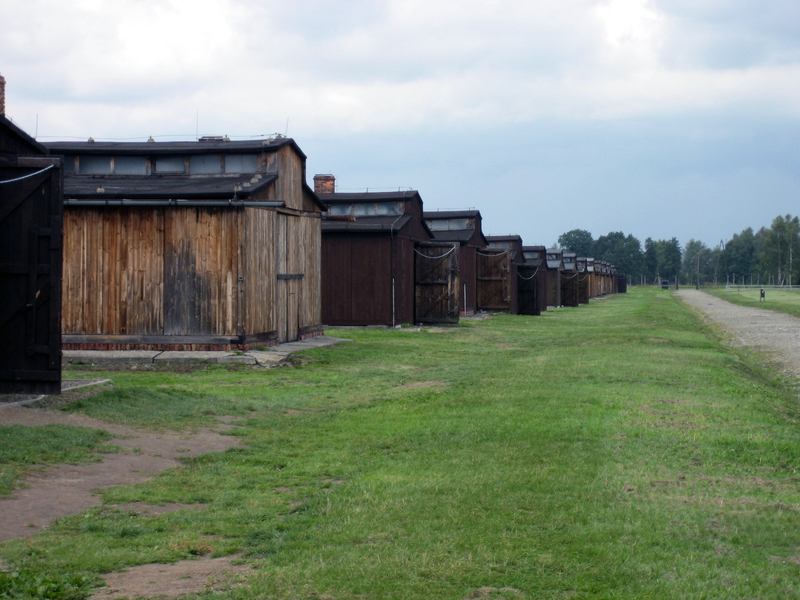 The town of Oswiecim, Poland was destroyed by the Nazis to make room for these death camps. In 1940 they converted an old army barracks to hold Polish political prisoners and intellectuals. They called this camp Auschwitz I. 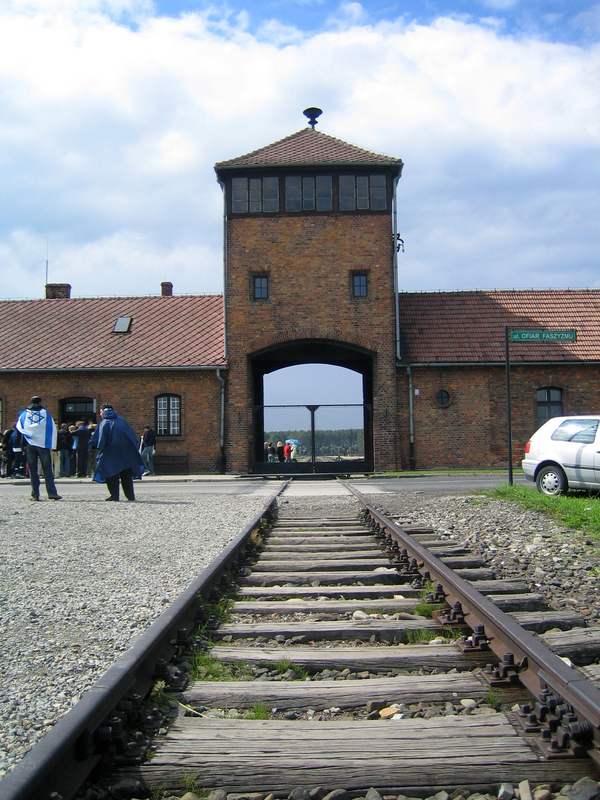 A year later, in 1941, they began building the confines of Auschwitz II, known as Birkenau. More than 30 times the size of Auschwitz I, covering over 500 acres, this camp was originally designated for Soviet prisoners. But soon after the trains filled with jews, gypsies, homosexuals, and the politically undesirable began to arrive, thousands of them each day. They arrived with suitcases filled with all their possessions, tricked into thinking they were just relocating their lives till the war was over. An SS doctor would meet them as they got off the train. It was a simple process for him. He would point his thumb either to the right or the left. Right would go to the work camps, left to the gas chambers. The photo to the right is where the train would arrive. Zyklon B, the gas used in the chambers was originally designed as an insecticide but when an inept soldier was spraying the barracks at Auschwitz I he inadvertently killed himself. This mistake enabled the Nazis with the horrible agent they needed to annihilate the Jewish population of Europe. With the two large gas chambers at Birkenau they could kill 2000 people in less than 20 minutes. The smaller two gas chambers at Auschwitz I would add another 700 each, bringing the total to 3400 killed in less than 20 minutes. The cold efficiency in which the Nazis terminated the lives of the prisoners was astounding, from determining who would live or die to separating their possessions into individual piles of suitcases, brushes, combs, cooking utensils, clothing, shoes and hair. Many of these piles remain just as they were found when the soviets liberated the camps in 1945. The human hair was used to make mattresses and blankets back in Germany. Our guide informed us that many of the blankets are most likely still in use today. The average population at Auschwitz/Birkenau at any given time was about 90,000, the life expectancy was 3 months or less. When the soviet army liberated the camp in January 1945, the camps looked deserted. There were only 8,000 alive. Ironically, when these survivors went back to what was left of their homes, they were hardly greeted with open arms. Most wondered how could they have survived. Did they trade the lives of their families for the their own? There was no escape from Auschwitz. 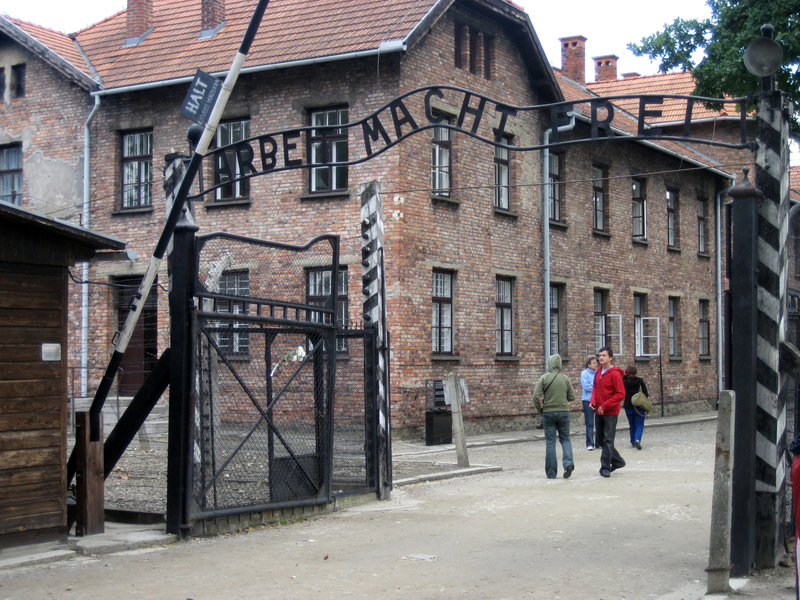 The 3rd Auschwitz camp, known as Monowitz was built in 1943. It was used exclusively as a slave labor camp for a chemical factory run by IG Farben. While this company was producing Zyklon B for the gas chambers at Auschwitz and all of the other death camps, it was also supplying the world with AGFA and ANSCO photographic film and BAYER Aspirin. Yes Bayer, safe enough for your children. There were over 800 attempts to escape the camp, 200 were successful. Most of these were from the minimal security of the Monowitz camp, but there were the four prisoners from Birkenau who managed to steal some officer uniforms and a staff car. As they rode through the front gate, they raised their hands and said “zeig heil” to the guards and rode away. The Nazis had barely enough time to destroy the large gas chambers and crematoriums at Birkenau before the Soviet Army arrived. They had orders to destroy all evidence of the death machines, but there wasn’t enough time to destroy Auschwitz I. Everything there remains in tact, as it was when the camp was liberated. On the entrance to one of the barracks is the famous quote of Spanish philospher, George Santayana, “those who cannot remember the past are condemned to repeat it”. Although this is a very overused quotation, one cannot stop and think of how humanity hasn’t really evolved much since 1945. The ethnic cleansing of Bosnia, Rowanda and Darfur are all too recent. The intolerance, persecution and paranoia of the world today is all too reminiscent.